Apologies if you've seen these already but some very interesting shots here - some really reminded me of growing up in the 80's, especially Coventry Theatre and Pool Meadow - BBC Photos. Apologies of the owner is already here but found this photostream which has some fantastic Coventry imagery : Flickr. What was the building to the left of the Fire Station with the pointed tower? Yes, very evocative! I would dispute a few of the dates (I thought the Broadgate ones were a little later), but they brought some good memories back! Thanks for the link. I don't know if this has been posted before, but there are some photos of Coventry on the Bridgeman website here. I have found this site - English Heritage photos of Coventry - the 'Coventry' search came up with 182 images. There are a lot of old street photo's that I haven't seen before (about halfway in, between cathedral shots). Worth taking a peek. I would like to know more about some of the streets, if anyone has memories of them, there's Russell St, Wellington, Rudge, Bury, Butts, Brook and quite a few more. I clicked on the details of the photographer of the old houses and he is John Prest, he published a book in 1960, The Industrial Revolution in Coventry, OUP, it isn't inundated with photos I don't think - about 15, there appears to be plenty available on the web so I think I am having one. Good book, well worth finding a copy. Great to see. Thanks for sharing. Just how many streets full of upper floor workshops were there! One photo is that of prefabs "on the edge of Coventry". I wonder where that could be? I grew up in a prefab in the late 1940's but that was was in Stoke Aldermoor where they certainly weren't laid out in neat rows as in the photo. Instead they had been built in two's and three's on odd parcels of land. DBC - I assume you mean the aerial photo. From the road pattern this is Canley with Charter Avenue running through the picture and Ten Shilling Wood and Pig Wood on the left hand side. I did not realise that this had been prefabs before the steel houses. Thanks for that Mick. It's surprising what little bits of information those photos show. For instance, the picture with the courtyard and grocer's van has a an old oil drum with the letters "G" and "OD" painted on it. It think that was for pig food. Anyone who has been watching "Wartime Farm" on BBC2 will be familiar with the term "pig club". We had one in Stoke Aldermoor. Somebody would keep a pig, and various householders would contribute their kitchen waste to feed the animal. Come Christmas they would then share the meat out amongst themselves. 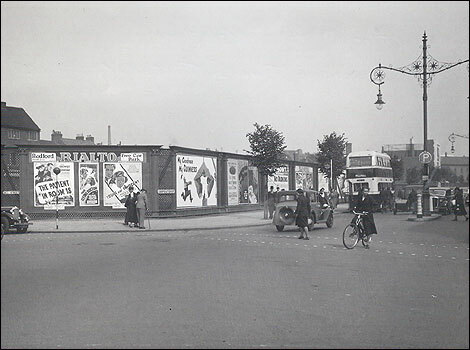 It's a much published picture of Hertford Square in Spon End. English Heritage want £400 for the rights to display it on here!